Owning an Alfa Romeo isn’t quite like anything else. Whether it’s a restored classic or a model fresh off the showroom floor, there’s usually something you want to know that’s not in the owner’s manual. Here’s a few of the questions we frequently get asked. You can ask your own by coming along to our Club meetings or by using our online contact form. What's "Alfisti" and is there a cure? What does the name "Alfa Romeo" mean? What is the symbolism behind the Alfa Romeo badge? Shouldn't there be an apostrophe in the Club name? Why do some Alfas have a four leaf clover badge? I'm thinking of buying an Alfa; what shoud I look out for? How do I identify my Alfa or find out more about it? Can I get concessional rego for my old Alfa? Where is the best place to get my Alfa serviced? Are red Alfas the fastest? Can I hire an Alfa for my wedding or school formal? Why is there a maxi-yacht named Alfa Romeo? What role did Alfa Romeo play in the war? Alfisti is the collective noun for people who share a passion for all things Alfa Romeo related. This passion often starts as a gentle appreciation of the Marque, but typically develops into a deep, almost irrational, devotion. It transcends nationality, age, gender, language, politiics and religion. Joining the ranks of the Alfisti is not, as some people have suggested, developing a medical condition, but it does frequently manifest in physical symptoms ranging from trembling anticipation to teary nostalgia when in the presence of an Alfa. There are Alfisti who don’t actually own an Alfa, but they are usually in transition between cars. The term is not to be confused with Alfesta, which is a periodic gathering of Alfisti. The singular form of Alfisti is Alfista, so you can be an Alfista joining other Alfisti at an Alfesta! In 1909, A.L.F.A. - the Anonima Lombarda Fabbrica Automobili company (Lombard Automobile Factory, Public Company) - was formed. In August 1915 the company came under the direction of Neapolitan entrepreneur Nicola Romeo. In 1920, the name of the company was changed to Alfa Romeo with the Torpedo 20-30 HP becoming the first car to be badged as such. What is the symbolism behind Alfa's badge? The Alfa badge is one of the most remarkable emblems associated with any marque. In 1910 a draughtsman named Romano Cattaneo was given the job of coming up with a badge for a new Milan-based company A.L.F.A. With the help of Giuseppe Merosi he developed the design for the famous emblem. It combines two symbols associated with the city of Milan since the crusades: a red cross and a serpent swallowing a man. The red cross of Saint George is a Christian symbol of medieval heraldry. The man in the serpent's mouth is supposedly a Saracen, so the serpent motif recalls the Crusader's defeat of the infidels. The serpent motif became an honorary sign awarded to a prominent Milanese family. It was eventually permanently attached to the Sforza family. Originally, the acronym ALFA and the word MILANO appeared on the badge separated with two square knots. The knots were associated with the di Savoia family; they and the blue encircling field symbolize royalty. The company was purchased by Nicolla Romeo in 1915, and his name was appended to ALFA. The wreath around the badge commemorates Alfa's World Championship in 1925. The badge has evolved over the years, being refreshed and moderised, but always retaining the key elements. The name of our Club often generates debate about possessive nouns and whether or not there should be an apostrophe in the name of our Club. That is, should it be Owner's Club, Owners' Club or Owners Club? There is a case for each version but the most common grammatical interpretation is that, as each word is capitalised, it should be considered a title and therefore "Alfa Romeo Owners Club" is the most approporiate. This is also the interpretation most other, but not all, clubs adopt. This grammar website is a useful reference for those wishing a more detailed explanation. Why do some Alfas have a four-leaf clover badge? The Quadrifoglio - the four-leafed clover is a biological oddity of the papilionaceous genus Trifolium. It is a recognised talisman for good luck and a symbol of excellence in selected Alfa Romeos. The four leaf clover was adopted by Alfa's racing team for the 1923 season and has remained ever present since. I'm thinking of buying an Alfa; what should I look out for? Buying a used Alfa is just like buying any other used car – only different. Of course each model Alfa has its strengths and weaknesses, but like any other purchase in life it’s always a case of caveat emptor (let the buyer beware). In broad terms, used Alfas can be divided into two camps, the "classics" and the "moderns". The dividing line is not always clear, but generally, the older "classics" (say, pre-1980s) are electronically simpler, but more likely to have mechanical or bodywork issues, while the "moderns" have increasing levels of electronic and mechanical sophistication. Each Alfa model can have particular issues to be checked - eg; 105 Series cars are starting to see metal fatigue in steering boxes; 901 Series Alfasuds may have a rusty spot or two; 162 Series V6s can have leaky cam belt detensioners; and, of course, the dreaded Selespeed in the "moderns". Some older models, particularly Spiders, may be American imports that have subsequently been converted to right-hand drive locally. If you are thinking of buying an Alfa, a good first step is to come along to a Club meeting, where you can ask an actual owner your questions about a particular model. You will generally get the full story, warts and all. If you are really serious, and obviously bitten by the Alfa bug, a Club member might even let you go for a spin in their car! The Club can also put you in contact with other Alfa owners via the Vehicle Register. Usually, an Alfa owner is always happy to talk about their cars – in fact it’s sometimes difficult to get them to stop! When it comes to an actual purchase, you have many options: buy from a private individual, a regular car dealer, via the internet (eg: eBay) of even import a car from overseas. The Club website has a Classifieds section where cars are offered for sale. Each mode of purchase has its own pros and cons, of course. While for many people purchasing an Alfa is driven very much by the heart, remember to remain sufficiently realistic – if you are buying a 40, 30 or even 15 year old vehicle, it is going to have a few faults! Once you have found something you like, a pre-purchase inspection is highly recommended – just as it would be if you were buying a second-hand Holden or Toyota. The Club website has a list of sponsors and advertisers; a number of the businesses listed offer pre-purchase inspections. Once you have made your purchase, get the car serviced by a reputable mechanic. A good rule of thumb is to have all the fluids replaced (oil, water, brake, etc) and timing belts replaced – a belt failure in most cars is an expensive repair! Can I get concessional registration for my old Alfa? Positively identifying your Alfa (particularly an older model) or discovering more about its provenance can be a bit of a detective job. Given that all Alfas in Australia are imported, there can be a lot of confusion about build dates, compliance dates and registration dates. Even the colour of your Alfa is subject to confusing (all reds are not created equal!). Usually, the easiest place to start is by talking to some of the experts in the Club, who at least will be able to advise on where to look for engine or chassis numbers! This extract from Fusi’s seminal work "Numbering of Alfa Romeo Cars – 1910 to 1972" (1.9Mb MS Word .docx) was posted on the Alfa Bulletin Board and allows you to match build date to engine/chassis numbers. It also provides instructions on how to contact the Alfa Romeo Historical Archive if you want to delve a bit more deeply into you vehicle’s history. A common myth is that European cars (like Alfas) are more expensive to maintain than Australian or Japanese cars. Whether or not this was ever true, it certainly isn’t the case now. Finding a good mechanic to look after your Alfa is a bit like finding a good doctor! You need to be comfortable with them and feel you can trust them. In truth, for a competent mechanic, Alfas are no more or less complicated than any other car. But, as always, experience and the right tools can make a difference between a good, quick job and a botched one. Some Alfa owners have found a local service station mechanic with sufficient experience and ability to undertake regular servicing of their Alfa, while others have found one of the specialist Alfa mechanics the best choice. You need to be realistic when it comes to having work done on your car. Labour is often a large component of the bill. A reputable, professional mechanic will charge anything from $80-130 per hour. Some jobs can simply take a long time, with an hour or so to remove a difficult component and the same time to re-fit it. Don’t ask for a total engine overhaul and expect a bill for $500! One note of caution; the more modern Alfas (like most modern cars) are now bristling with specialised electronics, sensors and explosive airbags, making it less likely that the average local mechanic has the necessary diagnostic tools and experience to tackle some of the servicing tasks. The Club website has a list of sponsors and advertisers; a number of the businesses listed offer Alfa servicing and spare parts. You can also come along to one of the Club meetings and talk to a Club member. They are usually more than happy to talk about their servicing experiences and offer recommendations. In addition, the online Club forums are another place to find out information. Don't Alfas have a tendency to rust? Sigh! Like all good myths, it has proven impossible to kill off this one. The fact is that Alfas have no more, or less, tendency to corrode than any other automobile made primarily of steel. Pretty much any car manufactured up until the 1980s - when car companies finally started to get serious about anti-corrosion measures - are candidates for significant rust. Ask any restorer of classic cars! Most myths do, however, have a grain of truth and the root of the Alfa myth probably lies with the Alfasud. This revolutionary Alfa was produced at a specially constructed plant in Southern Italy. Unfortunately, production suffered from frequent workforce strikes, poor workmanship and the use of inferior steel. With unpainted body shells (due to painters on strike) sitting outside, it was a recipe for disaster, with the cars - literally - beginning to rust before they left the factory. Unfortunately, the Alfasud woes were projected onto all other Alfa Romeo models, which had in fact the same quality as contempory German BMWs. It should be noted that BMW and most other companies also had serious problems with the very bad quality steel at the time. Alfa Romeo, like most other car companies, pretty much conquered corrosion problems in the late 1980s, with improved panel design and the introduction of body galvanising and other anti-corrosion treatments. If you are thinking of buying any pre-80s classic car a close inspection of rust-prone areas by an expert is a must. Our Club members usually don't hire out their cars. Typically, this is because Department of Transport regulations and insurance requirements limit this service to businesses with cars licensed as hire cars. In addition, members are usually reluctant to have anyone other than themselves drive their vehicles! That said, some of our members are willing to make their cars available for special occasions, either for free, or in exchange for a donation being made to a charity of their choice. The simplest way to make your needs known is to place a free classified on our Club website using the online form. Provide as much info as you can regarding event location, pickup points, date, time and preferred number/colour/style of vehicles. It also helps if you can spin a good story as to why you would particularly like an Alfa! 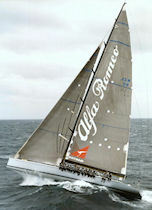 Several racing yachts have been named Alfa Romeo. All have originally been owned by Neville Crichton and sponsored by Alfa Romeo Automobiles S.p.A.
Alfa Romeo I (later renamed Shockwave, then Rambler) measures 27.43 meters (90.0 ft) LOA, 5.6 meters (18 ft) at the beam, 4 meters (13 ft) draft. She was designed by Reichel/Pugh, and built by McConaghy Boats, Sydney, Australia using carbon fiber composite construction. In 2002, she was first to finish in the Sydney to Hobart Yacht Race. She was first to finish in at least 74 races around the world. Alfa Romeo II (later renamed Esimit Europe 2), measures 30.48 m (100.0 ft) overall. She features a 44 m (144 ft) carbon fiber mast built by Southern Spars, water ballast, and a canting keel. She has been described as the fastest supermaxi monohull in the world, thought to be capable of 35 knots (40 mph; 60 km/h) downwind in a fresh breeze. In 2009, she was the first to finish the Sydney to Hobart Yacht Race. The Alfa Romeo III measures 21.4 meters (70 ft) LOA, 5.08 meters (16.7 ft) beam, and has a 4.80-meter (15.7 ft) draft. As were Alfa Romeo I and Alfa Romeo II, she was also designed by Reichel/Pugh and built by McConaghy Boats. Her interior design is styled after the Alfa Romeo 8C Competizione, in red, silver/gray, black and white, with a companionway ladder which resembles the car's grill. Which war? In WWI (1914-1918), Italy was allied with Britian, Australia, France and America. In August 1915 the company came under the direction of Nicola Romeo, who converted the factory to produce military hardware for the Italian and Allied war efforts. In 1928 Nicola Romeo left, with Alfa going broke after defence contracts ended, and at the end of 1932 Alfa Romeo was rescued by Benito Mussolini's government, which then had effective control. During WWII (1939 - 1945) the Alfa factory produced a range of military items for the Axis forces, ranging from aero engines to trucks and jeeps. Alfa production facilities suffered bady under Allied bombing, almost being obliterated. Alfa struggled to return to profitability after the Second World War, and turned to mass-producing small vehicles rather than hand-building luxury models.